Cameroonian pop singer, Dencia has stir up another controversy. This time the bleaching expert alleged that some of her business partners have defrauded her. 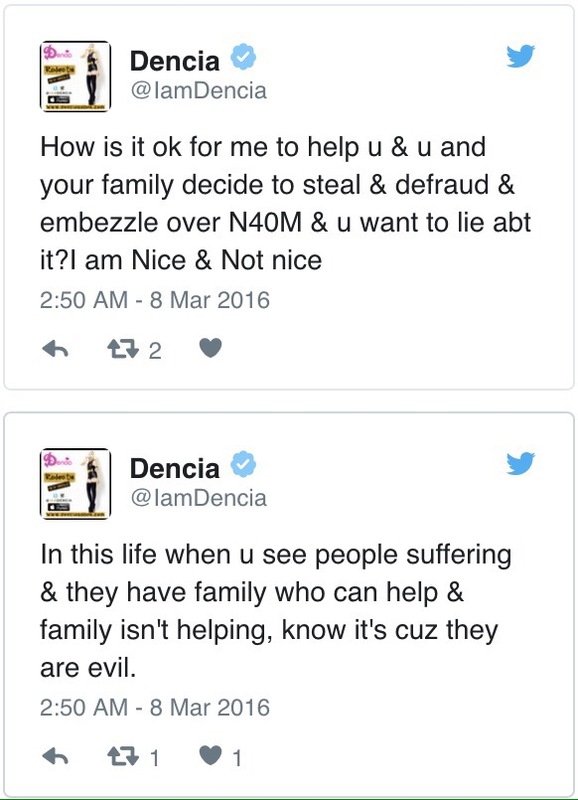 On Wednesday, March 8 Dencia took to Twitter to reveal that she was duped by people she trusted, people she said she helped. But on Thursday, March 9, Dencia went a step further to reveal the identities of her defrauders. She said her plan was to assist the lady and her family but in the end they dupe her of over N40 million. 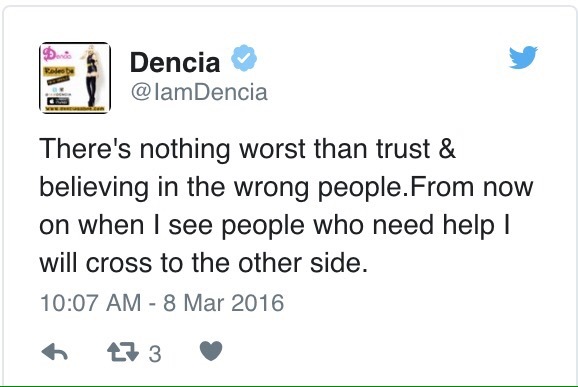 So bitter is Dencia that she swore never to help people again. Naming Miss Chuks Pearl Nneamaka Ogonna and her boyfriend Mr.Akinlonu Abiola Mobolaji as the people that duped her, Dencia revealed that she employed the lady to be the representative of her Whitenicious brand in Nigeria and other neigbhouring countries even without having met her before. She entrusted so much products worth millions of naira to her only to discover she has been duped of over N40m. Initially, she wanted to handle the case in her own way until the story took another dimension when Miss Chuks’ mother called in the police on Dencia and accused her of kidnapping Miss Chuks. And this made Dencia spill the bean. “To whom it may concern I will like to provide a timeline of how this aforementioned pair conspired to steal the sum of approximately 40 million naira from me and my company, Whitenicious Inc. In and around August 2014, I hired the aforementioned person -Pearl to represent my company as a salesperson in Nigeria and other neighboring countries. Her key responsibility was to sell and deliver products to clients who were unable to place online orders with credit or debit cards. Pearl was a fan who told me her family situation and I tried helping her by employing her. Clients were instructed to deposit funds only to her bank account and some paid cash on delivery. In 2014 between August and the end of that year, she reported sales of 6,259,089.49 million Naira. In 2015, 27.987,658.8 Million Naira and over 8.1 million naira so far in 2016. Collectively this amounts to over the sum of 40 million naira (estimated $200,000). The money was entrusted in her possession and an estimated 5 million naira was used for approved expenses and errands. I entrusted Pearl with the money and fulfilled my promise to assist in arranging for her to come to my company headquarters in California for training. I had never met her in person till I visited Nigeria on business in 2015. I successfully arranged for a two year work visa and footed her expenses to fly out business class to California and also provided her with all the comforts and amenities I share with my loved ones including my cars and home, known as @pumpsberry @rodeodrng on Instagram most of her followers can testify to the lifestyle I provided for her, she attended the BET awards last year and all the pre events, this year she attended the Grammy awards in the USA February 15th, I personally on many occasions bought her expensive clothes and shoes such as Gucci, Cavaoilli, buscemi, louboutins and more. She was treated like a sister and I defended her relentlessly during her public disagreement with a Nigerian celebrity out of loyalty to her. Miss Chuks use to retail Replica high end designer clothes, shoes, bags and more, when she visited me in 2015, I sat her down and told her it wasn’t a good look and instead put in money towards the business and buying authentic designer goods to resell. Unknowingly to me, she and her boyfriend Akinlonu Abiola Mobolaji were stealing the money she was entrusted with. In addition to these embezzled funds, an additional $15,000 was advanced to her to secure a location for a proposed boutique where I intended to start a venture selling high end fashion items in Abuja. The texts also detail how she conspired to defraud an additional $8,000 which I didn’t send. Everything was revealed and her criminal activities were unexpectedly exposed when I randomly was looking through her phone at 2AM March 2nd in an attempt to try to convince her boyfriend not to break up with her via text. I stumbled across the texts on her phone explaining in detail how she and her boyfriend Akinlonu Abiola Mobolaji conspired to steal my credit cards and banking information to attempt to buy cars. I had noticed some suspicious activities on my card prior to reading the texts and can only conclude she probably had something to do with it. I have asked my book keeper to initiate an audit to determine the exact amount stolen by this pair. When I confronted her with my evidence she confessed to the allegations and still cannot adequately account for the money she was entrusted with. She claims she loaned her mother Mrs Eddienwachukwu Chinwe blessings Nonyelum N3M and boyfriend Akinlonu Abiola Mobolaji N10M and $13,000. Her own texts in her own words explain how she was buying bottles of expensive alcohol and living it up with my stolen funds despite my generosity and kindness towards her. She has betrayed my trust and squandered the life changing opportunity I provided her. There are millions of people who will have cherished a similar opportunity so I refuse to let this change who I am as a person. Everything I did for her was from the kindness of my heart and without expectations. Despite the colossal betrayal, I still let her stay in my house and fed her. I was upset but never attacked her physically or verbally. I was more concerned about recovering my money, cutting my losses and having her return to her residence in Kaduna Nigeria. It was never my intent to let this situation develop into a public matter, I am not putting this out for the court of public opinions to judge us. My preference was to keep this situation as a private matter. I told her mom to buy her a ticket to return to Nigeria on the 5th of March (see attached message) but her mom ignored that because she wanted to come to L.A, I didn’t feel safe or comfortable with her at my house so I paid for her return ticket to Nigeria after her family didn’t act on it. 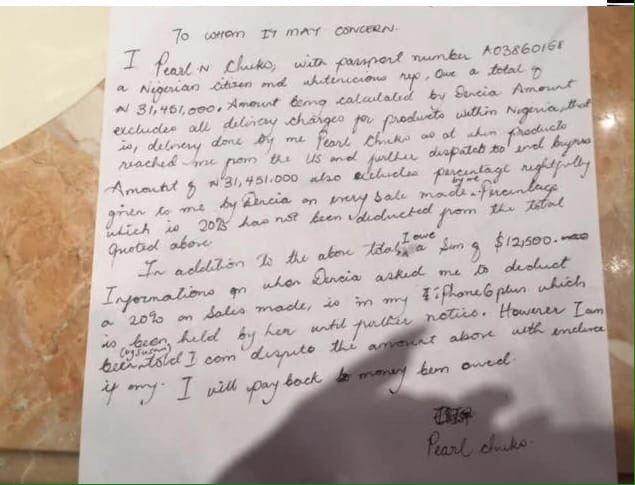 Her family was trying to put money together as they claimed (see screenshot) Her Dad claimed their pastor said the boy Akinlonu Abiola Mobolaji used Juju on her but I dismissed that because more money was missing not just what she gave the boy (see attached account information which excludes N8M from 2016 sales. 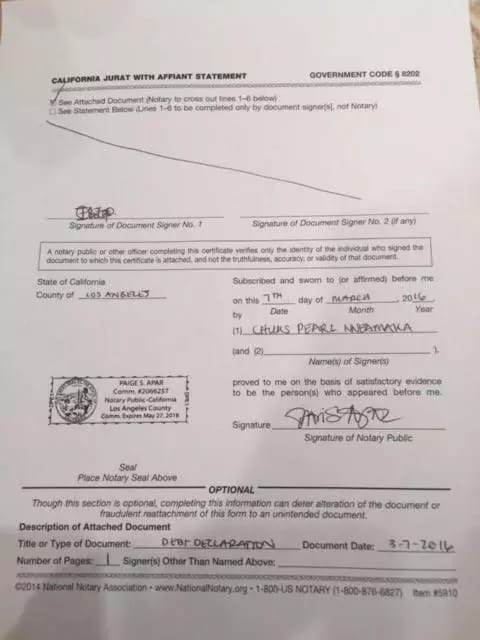 However, on Monday March 7th 2016, the police showed up at my residence in response to a criminal complaint from Pearls mother who claimed I kidnapped her daughter. Kidnapping is a serious crime which can result in decades in prison. Even worse, such a false evil allegation after what just happened to me was an unbearable insult. The police officers were shown evidence of a return ticket and I have videos of Pearl voluntarily confessing to stealing my money. I was asked to press charges against her here in California but declined. I know she will be jailed and deported and that will not get me my money. The officers explained how her mother’s intent was to have me arrested on Charges of attempted kidnapping so her daughter could leave scotch free but when they showed up and saw her walking my Dog outside. After questioning myself & Pearl they didn’t understand what the kidnapping story was about, they asked me if I wanted her arrested and told me the steps to take. My intentions are not for Pearl to go through the American prison system, her family doesn’t have the money to even help themselves talk less of lawyers in the USA plus I already didn’t feel safe with her being even in California as I didn’t trust her at all. I told the Ventura county police that this case will be handled in Africa where Pearl will be arrested upon arrival, I presented them her air ticket and the petition for her arrest. My only interest at this point is the recovery of my money so I am sending out this release in an tempt to recover my stolen funds. Frankly, I am utterly disappointed in her mother’s malicious actions whom I also extended my generosity to as well. Pearl told me how her sister was constantly mocked because no one believed she knew me so I decided to spend over $5000 flying out to New York where she was visiting from December to January ( I landed January 6th 2015 ) to meet her family and gave her mother money after she pleaded she didn’t have money to eat and move around, money to buy boxes and she had not bought anything for the kids and her husband.The same person is now claiming I kidnaped her daughter. It’s clear as day she is not remorseful and I’m beyond disappointed at her mother’s (Mrs Eddienwachukwu Chinwe blessings Nonyelum) response. Before my trip to New York Pearl claimed her mom wasn’t doing well in New York and asked me to send her $500 which I did, Keep in mind this is barely a month after my brother passed but I still found the space in my heart to help her mom. Again I never wanted to make this a public issue but I was advised by my legal counsel and numerous law enforcement agencies involved in this investigation to issue a press release to avoid any possible extortion or slander to my reputation.